Yesterday the Forest Service granted special permission to international logging company Interfor to begin logging the Jazz Timber Sale. Already one unit has been logged in spite of wet weather that exacerbates soil and watershed damage. Bark has filed for an emergency injunction, but we still need your help. We need you to ask the Forest Service to withdraw its wet-weather waiver right now, and do not permit any out of season logging. Please help us deliver a clear message to the Forest Service. Today: Contact Forest Supervisor Northrop at 503-668-1749. You will likely get her voicemail. That's okay! Here's the message: Please do not allow the Jazz Timber Sale to be logged until a judge rules it legal. Tomorrow: Thursday 11/7: Rally at the Forest Service Regional Office in Portland from 2pm-3pm. Wear brown to represent the mud flowing into the Clackamas River! Also, if you can help make phone calls about the rally, please call the Bark office at 503-331-0374. Just last week incoming Forest Supervisor Lisa Northrop described in a news release her commitment to involving the public in management of Mt. Hood National Forest. That’s just one reason we were shocked to learn that logging began at the Jazz Timber Sale just this morning. To add insult to injury, the Jazz Timber Sale is being called ‘restoration.’ Why is the Forest Service gambling with soil and water quality in the sensitive Clackamas Watershed under a false banner of restoration? Bark appealed the Forest Service’s decision on the 2,000 acre Jazz Timber Sale in October of 2012. We were thrilled when the agency withdrew Jazz last December, largely in response to our concerns regarding inadequate mitigation measures for soil and water quality. So when Jazz was reintroduced just several months later with no substantive changes Bark filed a law suit, and are currently in litigation with the Forest Service over the legality of Jazz. The Forest Service’s last minute exemption to Interfor to begin logging Jazz means the forest may be cut before a judge ever hears our case. Contact Forest Supervisor Northrop now, then join us tomorrow, and share it on Facebook. 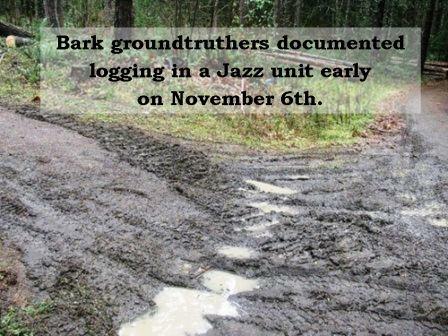 Check out more information on Bark’s concerns with the Jazz Timber Sale here.